Heat oven to 375°F. In small bowl, place melted butter. In another small bowl, mix sugar and cinnamon; set aside. Stir jelly until smooth. Seal tip of large baster with foil. Remove rubber bulb. Spoon jelly into baster; replace bulb. Bake biscuits as directed on can. Immediately dip each hot biscuit into melted butter, coating all sides. Roll in sugar mixture, heavily coating all sides of each biscuit. Remove foil from tip of baster. Insert baster in side of each biscuit; squeeze small amount of jelly into center. (Refill baster as needed.) Serve warm or cool. To reheat, wrap loosely in foil. Heat at 350°F 5 to 10 minutes or until warm. 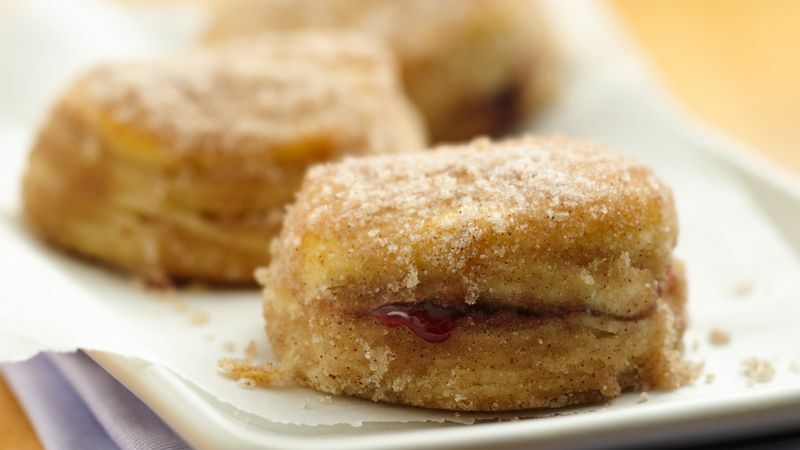 Have a favorite kind of Pillsbury™ Flaky Layers biscuits? Feel free to use them instead of the flaky buttermilk to make this recipe your own.